Weather-Witching the British Summer: Pros & Cons | QuantumPhoenix.net – Esoterica, Paganism & Ritual Magic. Here is a bit of magic..that I feel I instigated..on a collective scale.. and one that seems to have produced results! I have thought deeply about this matter, in light of droughts, torrential rains & storms, heat-waves elsewhere – all of which have caused ..even human lives! 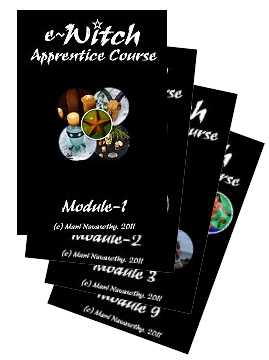 There are many people in the pagan communities and Wicca worlds (That’s the world of practising Witches!) who either attempt or claim to have powers of controlling the weather – a talent associated with Witches & Shamans of old..here and elsewhere in the ancient worlds.. ! The first question to ask – and I often do- is this: Can one insignificant person change the weather? (in the scale of a world that has nearly 7 billion, not to mention the trillions of other life forms on Earth). If one is so powerful as to be able to change the weather that affects the whole planet, surely he or she is almost a God or Goddess? And another question: Why on Earth would `nature or the weather forces’ bother to listen to one person anyway? Nature has it’s own plans, schedules, and when humanity interferes, it (nature) just takes related action.. as in when we people damage environment, nature just carries on in an alternative form. Whether we humans live, destroy or die is quite irrelevant to the larger world at hand, and to the history of Earth itself…surely? It will reach a new configuration of land-sea-air-life! So when we humans are going on about saving the Environment, let us be clear- that we are saving it for us- and trying to keep the environment suitable for us. That said, weather-magic is surely human interference on the environment too..surely? It’s as interfering as blocking a river, adding greenhouse gases to the the atmosphere in tons of human industrial process etc. Yes, rain may be something that the land needs …but the earth has to provide it. We can’t instigate it. That is still interference in the environment.. good or bad! 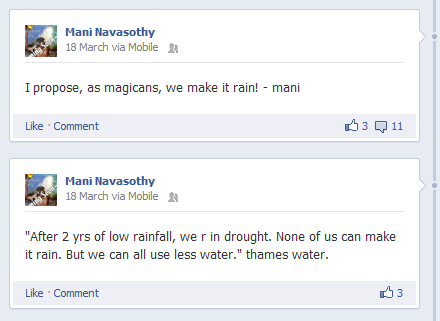 18March’12 – My call to pagans and magical friends, to do weather-magic for rain! Another thought that occurred to me quite often is.. that in ancient times, tribal cultures etc, people did magic to have rain – so that their crops can have water, and animals may drink etc. 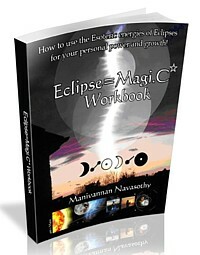 Sun-magic was not – in my view- as popular as rain-magic. And yet, in modern pagan communities that I know of.. so may magical practitioners are quick to want to do Sun-magic…for a good sunny day for a picnic or just to feel good (in western countries where there are shifts between summer and winter.. ). In my view, way too many people do weather magic for hot sunny days..and don’t quite think of the implications. After all, they are not doing it for some crops to have sun so harvest can occur, or some rainforest to thrive, are they? It’s pure selfish need, to have a sunny day. 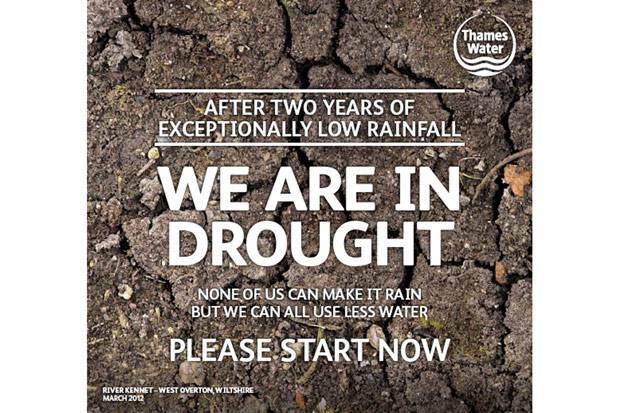 Anyway, recently, when I saw the local water company’s poster (in March’12) that said we (in UK) are in draught, after 2 years of low rain, and to be careful of water-usage (horse pipe pan!) I was roused. Firstly I don’t care much about watering lawns and gardens – that also is personal and selfish, decorative. Yes we need the water, not so much for gardens, but for woods and forests! 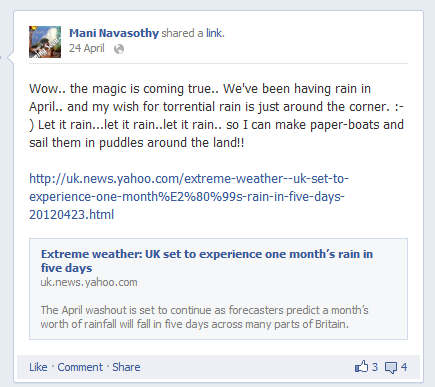 24th April’12 – Media reports the coming of more heavy rains. Here’s the facebook entry on that. Secondly, the poster said, `We can’t make it rain. But we can save water’. Now that caught my attention, and my magical ego (I admit) was tweaked 🙂 So I put out a call on facebook, asking for magical people to do rain-magic… After all, we are suppose to be magical, and we do believe we can do weather magic..(unlike water companies). Right? I think the call went out in March, and I wanted torrential rain..not just little bits… to solve the problem fast! And I believed that by calling on everyone’s magical abilities, it can perhaps be nudged. (I was born in a tropical island, in November during monsoon season, and I have always liked rain..more than the Sun.. as Sunny days in Uk means hay fever, being hot n bothered…etc). Yes,. rain IS my thing.. :-p I won’t go as far as to say I can control weather. But I will go as far as to say, I do like to do `Collective magic’ where I enlist the inner powers of everyone. Anyway, it started to rain…more and more.. and torrential too! Just the way I liked it. And now, few days ago, we are told in the media ..that the last of the water companies have lifted the horse-pipe ban. Good news. That’s not all. Only yesterday, we were having wild winds, and shaking trees. Dark clouds and thunder claps, and storms! I get excited when weather gets all stormy. I’ve been known to run to the sea-side at 80 mph stormy winds at midnight and stand on the edge! So yesterday, I went out, in just shorts, climbed the large Willow tree, and enjoyed the Storm, as it passed over me! And I got to thinking about brainstorms.. the storms that happen in our minds.. and the power of it all. And I thought I’d just breathe it all in.. into my head! It’s raw power of the elements! Am sure I’ve been low on energy for months, and this will do nicely as a natural top-up…till the next storms! 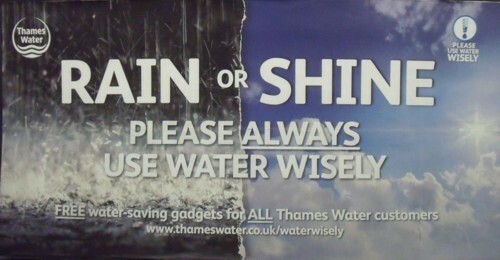 24th June’12: After a few months of heavy rain, Thames water still enforces the idea of saving water! I think the Rains and storms ate enough now. It’s caused so much disruptions, devastations, damage, and even death in the UK, while in America – they are having the worst hot weather ever..where many people have died. Sadly, and dangerously, there’s balance for you.. energy has to come from somewhere. Rain here means heat there. Le’s now work for balance..or rather, let Mother nature get back to her own schedules and plans..and let’s not interfere! I just heard that the jet stream is moving back into its normal position and the normal weather patterns will be resuming from the end of the week. You have magical intent pouring out of you Mani!